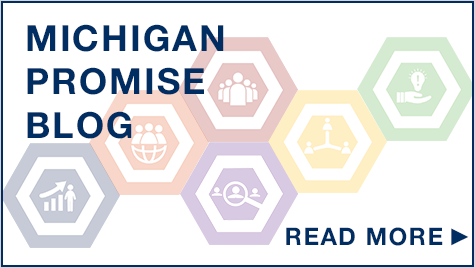 There is no question that when a surgeon or scientist comes to work at the Department of Surgery at Michigan, most hope to improve patient care through innovation. However, finding ways to facilitate translational and commercialization endeavors, while managing busy clinical practices and research discovery efforts, can be challenging. 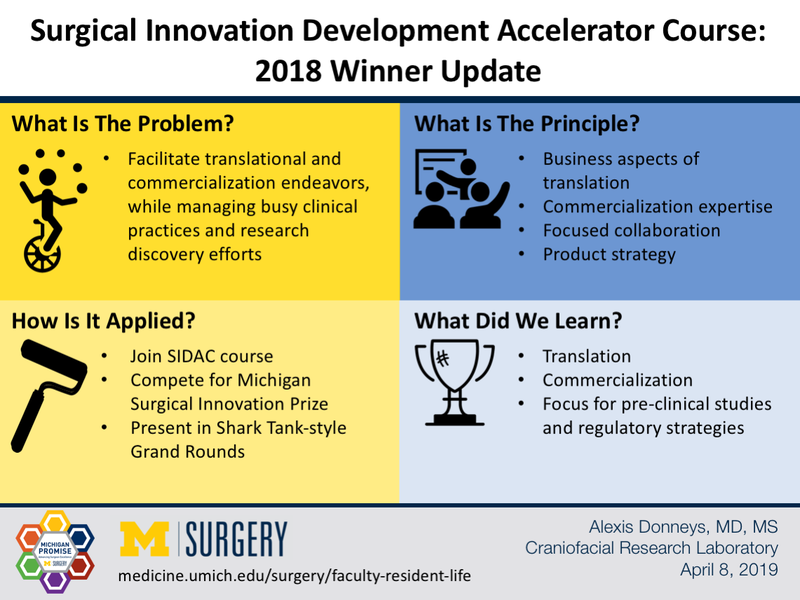 The Surgical Innovation Development Accelerator Course is a 9-session didactic course offered to faculty in the Department of Surgery devoted to training surgeons and scientists to think about the business aspects of translation. The course is taught by commercialization experts, and covers a diverse range of applicable topics, such as: value proposition, customer discovery, customers and markets, intellectual property, regulatory pathways, prototyping and pitching. The course encourages teams to apply with an idea that can be nurtured, and in that way, participants receive a focused collaboration designed to improve their product or commercialization strategy. This year, our laboratory (The Craniofacial Research Laboratory) was among 12 teams to join the first SIDAC course. In addition to the course, we were also competing for the Michigan Surgical Innovation Prize, which was a $500,000 fund provided through the Michigan Promise that was to be divided among the top six teams. The competition culminated in a Shark Tank-style session held during Grand Rounds and was judged by three guest experts (venture capitalists/entrepreneurs). We learned an enormous amount about what it takes to truly take an idea from the bench to the bedside. When we began the course, we were confident that our technology “worked” from a scientific standpoint and made a lot of sense as a clinical solution to a difficult problem. We quickly learned that that those factors are just the tip of the iceberg when it comes to translation and commercialization. While most of us were surgically or scientifically skilled, it really felt like we were back in the classroom learning something completely new. The difference was, this time, the lessons we learned could make a big difference in improving surgical practice and patient’s lives on a larger scale. Our team Ferroximend (Steven R. Buchman, Alexis Donneys and Chitra Subramanian) won first place in the competition and received funding, important guidance, and invaluable feedback that has helped us to focus our pre-clinical studies and regulatory strategies in a manner aligned with translation. Ferroximend is a bone filler device that accelerates fracture healing and facilitates fracture healing in difficult cases. Hopefully, one day we will see it in the operating room. We are grateful for the opportunity and will continue to view our surgical and scientific endeavors with the bedside in mind, and perhaps, with a bit more understanding of what it really takes to translate!